How did you hear about Jasmine Rose (JR)? What services does JR provide? To my knowledge, mostly floral arrangements for weddings and other events. (RN did some research and it appears Jasmine Rose also sells beautiful flowers which can be ordered via their website. They offer delivery services as well). What were your initial expectations of JR? I didn’t really have initial expectations. I just hoped they’d be good. Describe your experience with JR. I wasn’t sure if I wanted real or fake flowers for my wedding, so by the time I’d made the decision it was already 2 weeks to my wedding. I reached out to JR and their staff was very courteous and professional. I went to take a look at the flowers I wanted and made my selections. On the wedding day, JR delivered (even with the short 2 weeks’ notice) and I was very pleased with the floral arrangements at my wedding. It depends…especially on the type of flowers. However, prices may be negotiable. On a scale of 1 – 10, what would you rate JR and why? 10/10! I was very grateful to have found JR and I wouldn’t change anything about my experience with them. Keep up the good work and thanks for making my wedding a success! Wow…A 10/10?! that’s fantastic. Really, this is what enterprises should be about,adding great value to lives and surpassing the expectations of clients. Great job Jasmine Rose..do even more. I couldn’t agree more!! In our 3.5 years of running this site this has got to be one of the very few reviews where the customer expressed complete satisfaction! Yaaaay! It’s very rare we get reviews like this but really excited to read this! 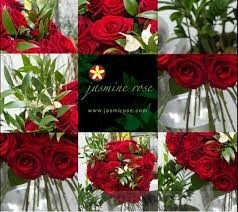 I’ll have to checkout Jasmine Rose…maybe vals day flowers for my mum just because. Thanks for the splendid review!